Is Kenya’s GDP data turning a little too Chinese? Capital Economics, one of the world’s leading economic research firms has said it has doubts about the accuracy of GDP figures released by the Kenyan Government, which suggest the economy is very robust than it seems. Ashbourne says that they are worried that the Government may be misrepresenting the health of East Africa’s largest economy. The past two years have been very difficult for most African economies. In 2016 a painful combination of external headwinds mainly as a result of lower commodity prices and bungled policymaking which pushed many of Africa’s largest economies into recession. Growth in the continent as a whole fell to a 22-year low. Kenya, however, seems to have sidestepped this regional slowdown. 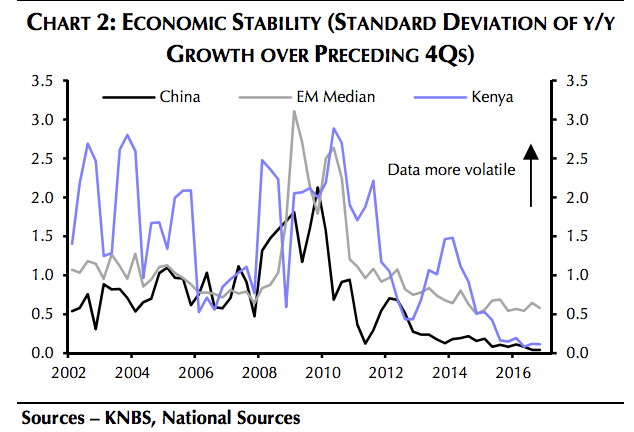 The research further notes that the marked stability of Kenyan growth raises questions about the quality of the figures from the stats office (KNBS) considering that the country’s GDP growth has traditionally fluctuated significantly from one quarter to the next. 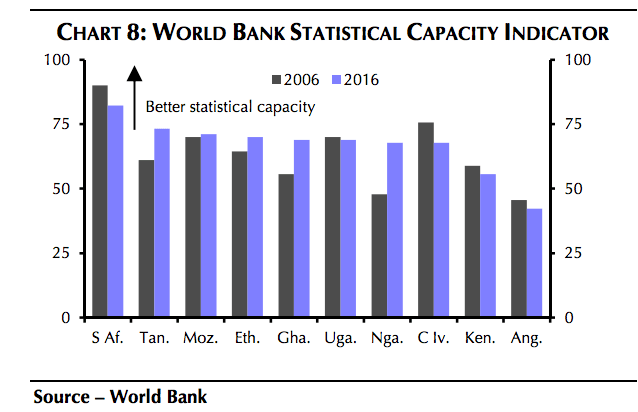 “In 2015 and 2016, growth numbers produced by the Kenyan authorities were almost as stable as China’s carefully-managed official growth figures.” read part of the research note. Capital Economics also argues that the 2o14 rebasing of the country’s GDP figures is not enough to fully explain the stability of Kenyan GDP figures. For instance, the comparatively volatile agricultural sector now makes up a slightly smaller share of output. Agriculture’s share of output only slipped from 23.4% of GDP in 2009 to 21.8% in 2016. Over the past two years Kenya has benefited from looser fiscal and monetary policy, experienced a Chinese financed investment boom, and suffered from a reasonably serious drought. None of these shifts are easily discernible from the official growth figures according to Capital Economics. “It is sometimes difficult to square the strong and stable growth reported by the official GDP figures with more volatile activity data from elsewhere in the economy. Some variation between activity data and official GDP is normal (particularly in Africa). But in Kenya’s case these unexplained variations seem to be growing. Import volumes, for instance, suggest that domestic demand is weaker and less stable than is being reported.” read the report. Trade volumes are not the only activity measure that contradicts the official GDP figures. 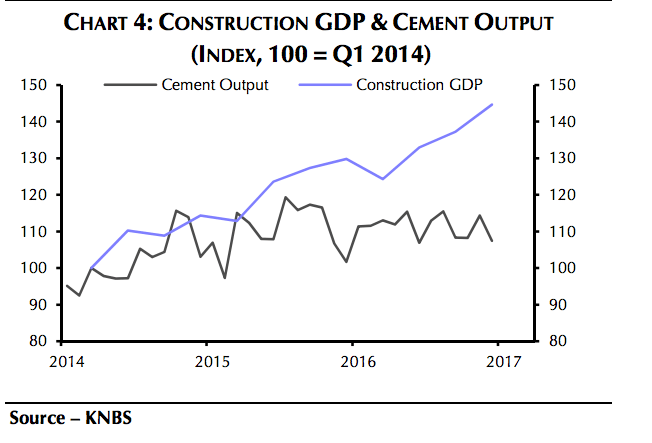 The official gauge of construction GDP, for example, surged ahead in 2015 and 2016 despite the stagnation of Kenyan cement output. And it’s worth noting that Stanbic Bank’s monthly PMI – one of the few professionally-recorded surveys of the economy as a whole has been deteriorated in 2016 and 2017 before falling sharply over the last few months.